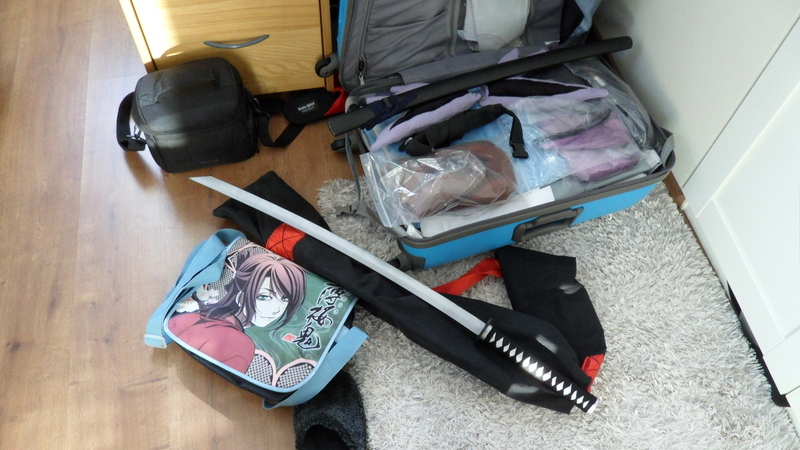 Shiro Samurai's Cosplay: Närcon Vinter 2013 preparations! Tomorrow 13:45 Swedish time I will leave for Haparanda bus station to take the bus to Luleå.. and from there I'll take the train to Stockholm and further to Linköping.. to Närcon Vinter! I actually started packing my suitcase already yesterday. I'm not quite done yet. Speaking of suitcases, I bought myself a new one last week. I got it for 50€ (I had a 50€ gift card hehe) and it has a pretty nice size, not too small but not too big either. Just right for me! I took out my Hijikata swords (although I've used them for other characters too) yesterday to check them and I managed to break the very tip of the longer sword when I took it out of the sheath too hastily. This was no surprise because there's been a crack on it for a long time *coughsinceuppcon2012cough* but it hadn't fallen off so I didn't mend it back then. Now it indeed broke off so I took some glue and glued the chipped piece back in place. After I had glued it back in place.. 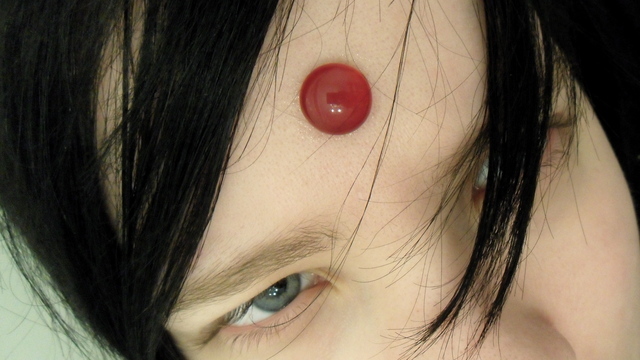 I've also got my hands on a small red glass pebble some time ago and, because I won't have time to try on the whole Espeon gijinka before the con, I decided I should at least check if the pebble would stick to my forehead with some spirit gum. 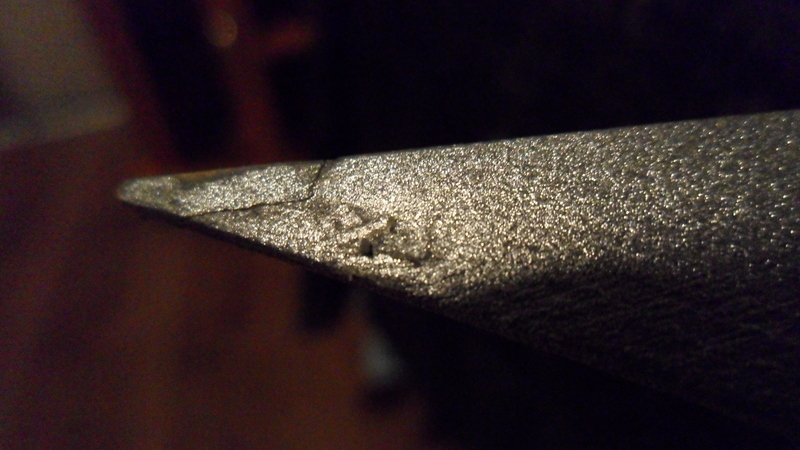 It did.. after some pressing. This means my Espeon cosplay is ready! No hinnat vaihtelee aika reippaasti mikä päivä/aika mutta 20-25 vuotiaalle semmoinen 550 SEK - 1000 SEK per menosuunta. 16-19 vuotiaat pääsee about 100-200 SEK halvemmalla per menosuunta. Tosiaan lentämällä voi myös päästä tosi halvalla (jopa halvemmalla ku juna) jos on joku tarjous/viime-hetken-matka tai jos tilaa "ungdom" (nuoriso). Hoks! Lähin lentokenttä on Luulajassa. Eli joudut Haaparannalta ottamaan bussin/taksin/jotaki. Also were did you get the gem for Espeon? 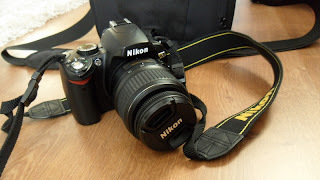 And le digital camera looks all awesome, can´t wait!